We are delighted to have been shortlisted as a finalist in not one but two categories in the Charity Times Awards 2016 – for Charity of the Year, with an income between £1 million and £10 million and Campaigning Team of the Year for our Never too Young campaign. Charity of the Year is given to a charity who the judges believe has consistently delivered outstanding service to its beneficiaries, promoted and raised its cause, been clear in its goals and strategy, and demonstrated excellence all round. Campaigning Team of the Year is awarded on the basis of innovation and real quantifiable results that achieve, or exceed, the aims of a campaign or campaigns. The Charity Times Awards continue to be the pre-eminent celebration of best practice in the UK charity and not-for-profit sector. 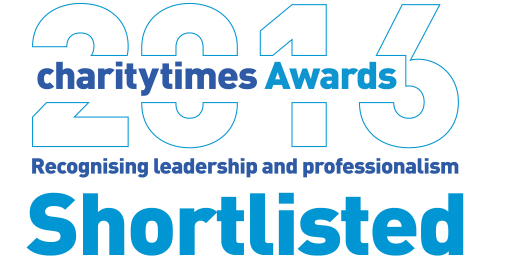 Now in their 17th year, the awards are run by Charity Times Magazine - the leading title for UK non-profit professionals. This year’s winners will be announced at the Charity Times Awards Gala Dinner & Ceremony on 28 September 2016 at the Park Plaza Westminster Bridge, London. The event was attended by over six hundred guests in 2015 and this year is set to be bigger and better than ever.